This is rather a long post, I’m aware. It deals with something troubling, and my soul won’t rest unless I write this all out. I don’t write this to spark debate. I know in whom I have believed, and I know what I believe. I did write this, so that if you read this, and happen to come across one of the misguided individuals who believes this falsehood, you’ll have been forwarned. Recently my spirit was grieved deeply to see a certain gentleman on YouTube, proclaiming a bold-faced heresy. This man’s entire focus is dedicated on spreading the false doctrine that the Bible, the Holy Scriptures given to us by God Himself through the authors, is itself, the Mark of the Beast. Further, he declares that God is the one who showed him this, and is convinced that this heresy is accurate. Sir, if you’re reading this, I hope and I desperately pray that you’ll see your error and repent of this insult to God’s Holy Word. It’s bad enough to spread such falsehood, which will confuse many, and be gladly accepted by those poor souls looking for any excuse to not read the scriptures. But to say that God gave you this ‘illumination’ – that’s an abomination. This kind of message is purely demonic. Can you honestly tell me, that Almighty God will allow this slander of His Word to go unpunished? That the God of this Universe, would allow His precious scriptures to become corrupted, as is the suggestion? It is God’s Word – He has always protected His word. If it were able to be corrupted or snuffed out, it would have by now, but it has not. Why? Because God’s Word is a sacred thing. God has kept it, preserving it so that believers everywhere may have access to His true word, untainted. I cannot believe that my Sovereign God would allow His word to be corrupted, and then while still corrupt, be spread to billions of souls searching for Him. I cannot accept the statement that, since the Bible contains 66 books, it must be the Mark of the Beast. This teaching is Satanic! Sir, this above paragraph is the blasphemy. Mixing a little truth with a little heresy doesn’t make this heresy less evil. It makes it more disturbing to see. God’s Holy Word is given to us by God! To call it blasphemy is to blaspheme God Himself! Your suggestion that it’s the mark of the beast implies that God must be the Beast. Your suggestion to ‘tear up your Bible in Jesus name’ is a complete and utter insult. Words cannot convey how utterly wrong this is. This is straight from Hell. You seem to think that people who appreciate the Bible think it will save them. Of course the scriptures themselves don’t save, only Jesus saves, but the scriptures are here for a purpose, and that is to educate us, God speaks to us through them. 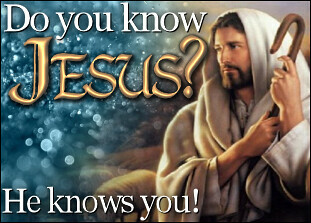 To truly love Jesus is to want to know all about Him, and the best source for that is the Bible itself. To look for reasons why the Bible can’t be the infallible word of God is purely demonic and can only come from a heart that isn’t truly right with the Lord. A heart that -is- truly right with the Lord will hunger not only for God’s presence, not only for time in prayer, but for time in study of His Word! Yes, Jesus is the Word. We know that. ‘The Word became flesh’ is a very familiar statement. He IS coming back with the name the Word of God. But these facts don’t diminish the Bible. They don’t disprove the Bible. The rest of the above paragraph makes my insides churn. Do you know what really makes any part of scripture a dead letter? Dead preachers trying to give a message from it without prayer. An atheist with a hardened heart looking at it without an open mind. A false prophet using verses out of context to back up heretical theories that are not of God. These things make it a dead letter. But a person filled with the Holy Spirit and burdened with a message truly from God, who draws upon scripture, this gives life, because this can lead hearts hungering for Christ to Him. How, by holding a Bible, is someone automatically worshipping it above God? If they are, they’re misguided, certainly. Once again, how can scriptures be blasphemy when the contents were God-given to the writers? How is the bible an ‘image’? Especially when it’s of God himself, not some pagan idol? If you ask me, the one who denies the Bible, especially the New Testament, is the one denying Jesus, by wilfully ignoring the record of His teachings. Is this suggesting that no one who reads the Bible is called? What a baseless and ill-educated statement. There are many people who love Jesus, hear Him, are led by Him – who read scriptures and give them the respect they deserve. People filled with the Holy Spirit, who led God lead their lives. Without any scripture, what you rely on is word of mouth alone to spread the Gospel, and all it would take is one person who misunderstood something, to warp the Gospel and mislead countless people. Without any scripture, passing the Gospel through the generations would be like a thousands of years long game of ‘telephone’ in which fact after fact is twisted, misrepresented, and soiled. How do we keep this from happening? Simple! A written record of the scriptures, that must be reverenced and carefully translated, fact checked, and treated with care as it is handed down through generations. I won’t even address the rest of what he says except this one thing: he states essentially, that “Satan wont let Holy ghost filled people live in this world.” Well, sorry but that’s incorrect. Of course, many Holy Spirit filled men and women have been in situations where they ended up becoming martyrs for Christ. But not all. The Holy Spirit came down at Pentecost, and it hasn’t left. God preserves many Holy Spirit filled people, He wouldn’t allow them to just all die, until none remained. Then who would reach the lost? To conclude, I’m deeply saddened by this gentleman. I’ll be praying for him, that he’d see his error. We should be leading souls to Christ if we truly love him. Not pushing false gospels on them. Not causing divides in the body of Christ. Not claiming God gave us a message when the message is so contrary to -everything- that has been preached by Holy Spirit led people to this point. I am by no means calling Constantine, the Popes, or King James saved, or Holy Spirit filled. Only God knows their secret selves and where they abide now, whether it be in Heaven or Hell. But I know God used them, whether they intended to be used or not. In my humble opinion, if you’re calling yourself Christian, love Jesus, and are literate, you’ll read the Bible out of your love for God. If the prophet speaks in the LORD’s name but his prediction does not happen or come true, you will know that the LORD did not give that message. That prophet has spoken without My authority and need not be feared. Unless you’ve been on a deserted island without radio, television, or internet, odds are you’ve heard something about an individual named Harold Camping. To cut straight to the point without any fluff – Camping is a false prophet. This fact is plain to see, and his heresy has been widely exposed not once – but twice! And yet somehow he manages to continue to fool people. He isn’t the only person making such boastful claims, stating that he is somehow special enough that God would deliver to him a date that no man is meant to know – however he has gotten a lot of attention, and so is the one I’ll address. He rebuffs any mention of Matthew 24:36, and Mark 13:32, which both clearly state the same crucial piece of truth. To paraphrase, men don’t know. Angels don’t know. Only God knows. So, simply, Camping shows exceeding arrogance by thinking that he is above scripture. Unfortunately, setting dates for the rapture isn’t the only flaw in Camping’s personal doctrine. I won’t discuss those here because that’s drifting from my main point, which is that we, as humans under a sovereign God, have absolutely no right to try to elevate ourselves so much that we think we can do what scripture tells us we cannot. The words of scripture that state so clearly that no man knows, not even angels – that came from Christ. If you are a Christian then Christ is your God. And if Christ is your God you’d better be believing His words! His own words say it! And if your God said it, the same God who made the earth and everything in it, the same God who is faultless, who is all powerful, and all knowing – who are you to claim that you know something He Himself said you don’t? It is an act of disobedience to Christ to make such declarations. The same as any sin – and yes, I believe it is sin to lead people astray. This assertion by Camping has led many astray, and tarnished the image of Christianity as a whole. If it were not sin, it would not cause so much damage! Camping’s version of ‘truth’ is nothing but a Satan inspired blend of a little bit of wheat with a whole lot of chaff. As we all know, May 21, 2011 was not Judgement Day, as Camping so boldly proclaimed. His statements lured many lost lambs who didn’t have the discernment to see that his word was false, and that’s one of the bigger tragedies of the situation. Another being the fact that the world watched him make his prediction, watched it fail, and many consider it proof that Christianity is a joke. Christianity is not a joke, Harold Camping’s predictions however – were. And not a funny one. Oh beloved…it doesn’t take much spiritual discernment to see that this man was, is, and most likely will continue to be nothing more than a false prophet. Camping has already stated a new date for ‘Judgement Day’ as being October 21st, 2011. So soon after his newest error was shown to the world. A wiser man would have been shamed into repentance and not repeated the same error yet again, so boldly. This lost soul needs much prayer. The man is so convinced that he is right that it’s sad to watch. 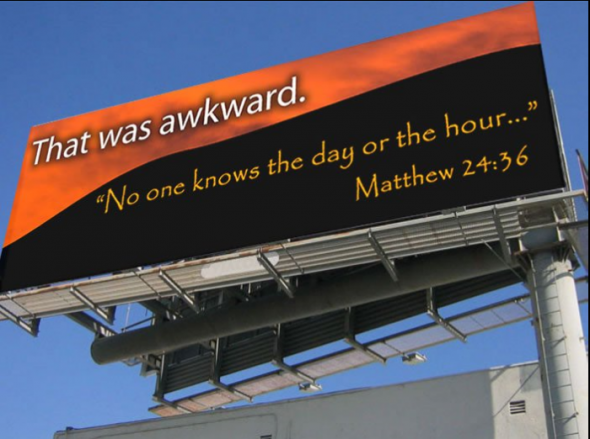 Once again – no man knoweth the day and the hour. Why? At least one reason: a push to keep yourself in a perpetual state of readiness for Christ’s return. We know He’s coming back. We know His return is near. The signs are all around us, increasingly, undeniably. From the weather, to conflicts between groups and nations, earthquakes, economic catastrophe, and so much more, it is evident that our world is heading towards its breaking point. Even the ungodly use such words as ‘God’s wrath’ and ‘apocalypse’ to describe the disasters currently befalling our world. Even Camping himself, as a false prophet, is proof that yes, Christ’s return is near. But don’t believe the dates this man sets. Be ready at all times. Christ’s return may be today, or tomorrow, or next year…or a handful of years in the future. The point is, we just don’t know. We’re not meant to. Whatever amount of time we have left, it would be far better to spend it praising God and allowing Him to move in our hearts and in our lives than to dwell on a calendar date with fear. Days come and days go. God doesn’t work on our time, He works on His own. He knows when He will return. Our job is not to know. Our job is to be ready.